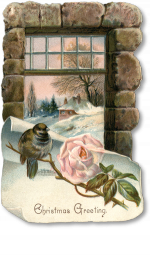 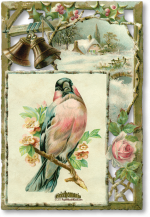 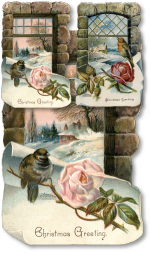 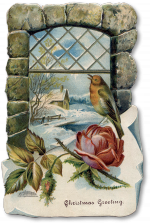 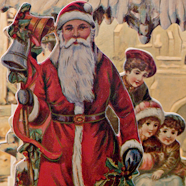 Deck your packages with boughs of holly with this delightful vintage die-cut card. 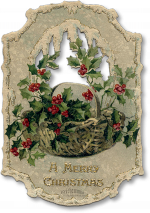 You can almost see the lovely embossing of the original, including the "A Merry Christmas" raised gold lettering sprinkled with snow. 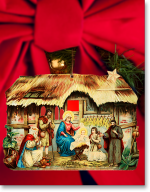 Print this Crèchemania Free Download full-size and send as a card, or reduce 50% and use as a gift card. 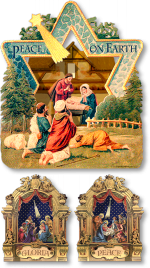 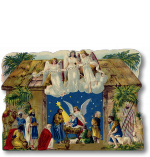 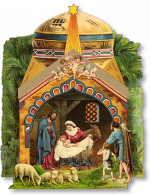 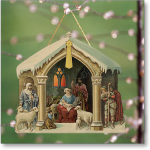 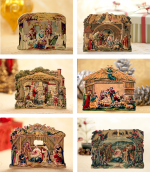 This collection includes the Dome Miniature Nativity 1 & 2 Premium Downloads for a special price. 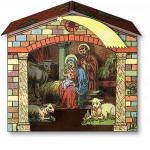 Both crèches share a middle-East-themed manger topped by a dome, a six-sided star, and a brightly decorated entrance that frames the Nativity. 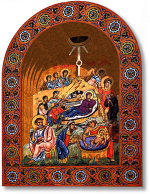 In Dome Miniature Nativity 1, the Nativity depicts the Adoration of the Magi. 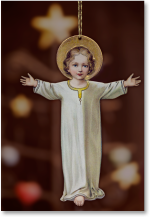 Angels fly above, and the Kings of the East, in ornate robes and wearing gold crowns adore the Newborn Child. 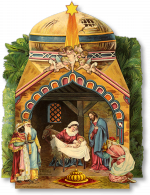 Dome Miniature Nativity 2 features the Adoration of the Shepherds. 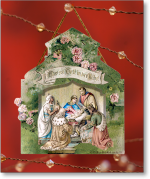 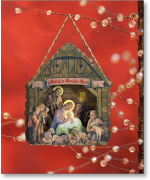 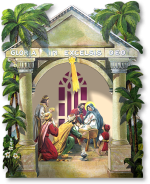 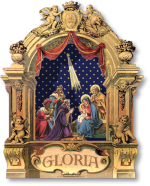 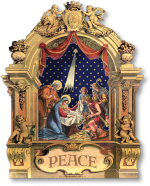 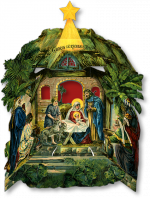 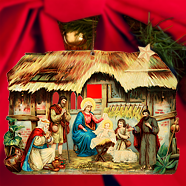 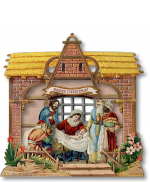 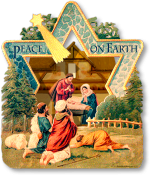 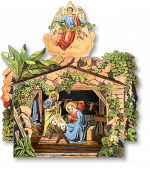 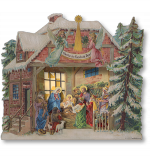 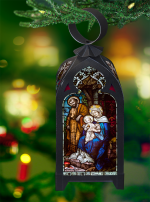 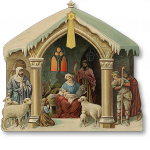 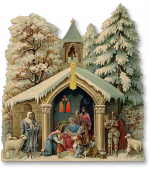 A quality 8.5 x 11 sheet, ink jet printed with fade-resistant UltraChrome inks on heavyweight professional paper gives you six miniature nativities to cut out and display. 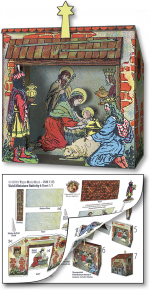 They measure just 3.5 x 2 5/8 inches, so they'll look perfect just about anywhere. 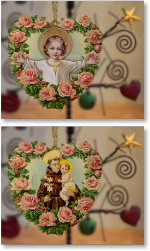 You also get a Premium Download that you can print over and over, so you'll be decorating your Crèche Tree in no time at all! 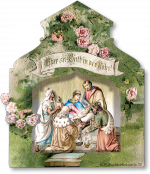 This miniature version of the Fleur-de-lis Nativity isn't just smaller in size — measuring just 3.5 inches wide — it also features a simplified design suited to its small size. 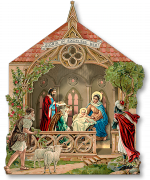 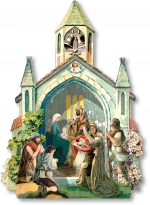 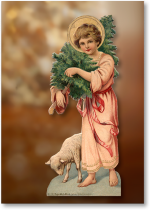 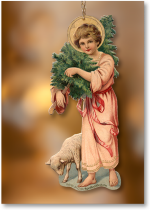 The tall trees and bell tower might be gone, to allow for its miniature size, but its lovely artwork featuring the Adoration of the Shepherds delights. 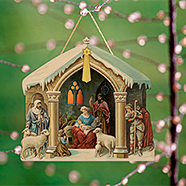 Tuck it among your Christmas tree branches or add a gold cord and hang it from just about anywhere. 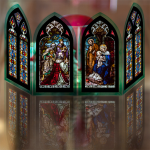 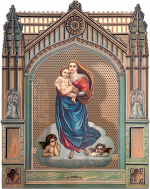 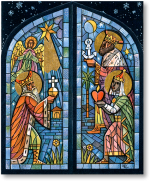 A Premium Download to create one diorama — a Gothic tracery of trefoils and pinnacles adorned with the Stations of the Cross — for displaying the Good Friday tableau (Jesus is Laid in the Sepulcher) or the Resurrection. 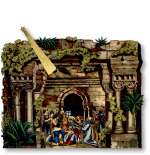 Imagine young eyes opening wide when, on Easter Sunday, the Good Friday Diorama becomes that of the Resurrection. 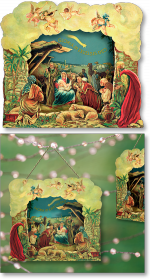 Both scenes are lovingly drawn, and the Good Friday & Resurrection Diorama could become a meaningful personal devotion, or aid for home, church, or school catechism. 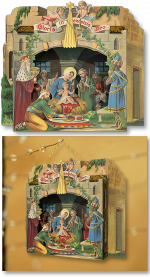 Can it be? 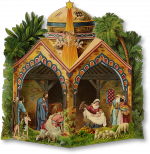 That a small scale does not diminish the beauty of a crèche? 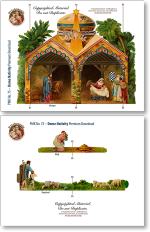 This certainly seems to be the case with the Santa Maria Novella Miniature Nativity Premium Download and Printed Sheet. 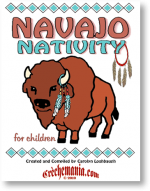 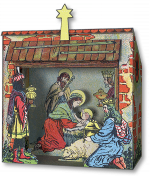 From the prodigious collection — and gifted brush — of Svatava Vizinová comes this Free Download of a beguiling paper nativity for you to print, cut out, and display. 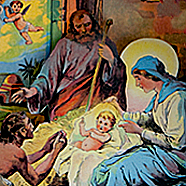 Svatava Crèche No. 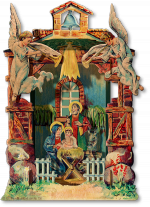 5 features folk costumes, a layering of colors, artistic playfulness, and a fine rendering of lines found in podmalby — reverse-glass painting — one of Svatava's specialties. 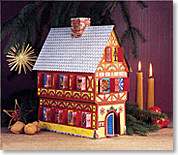 In the 18th and 19th centuries, podmalby flowered in Bavaria, Moravia, Slovakia, and Bohemia, home to Svatava's Zábrdské Betlémy Museum.